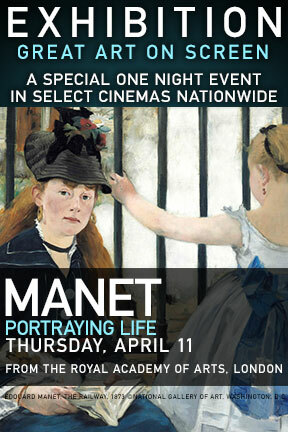 Earlier tonight I saw the one-night only documentary, “Manet: Portraying Life” that chronicled the exhibit at the Royal Academy in London. The film’s producers said that they were looking to reach the over 40 crowd. Well, from what I saw in the theater over 60 would probably be more accurate, but that’s one of the reasons I loved it. One of the hardest things about these “blockbuster” exhibits is the wear-and-tear on your body. It can sometimes take over 3 hours to fully digest a big show like this. I have a degree in art history, worked for two years at the Met and I love art, but after two hours even the best shows begin to lose my interest – and, frankly, my feet start to hurt. I can’t imagine how I’ll tough it out at 70. This clever producer found a way to make viewing a show more comfortable for the masses and considerate of older art lovers. A narrator gave an overview of the exhibit and spoke about Manet’s life and this was interspersed with segments where art historians, artists and even actor Fiona Shaw provided insightful commentary about some of Manet’s most famous works. I really enjoyed it. I think it’s great how museums are embracing technology and social media to reach more people. I also love Manet, so I really enjoyed all the close ups that showed his brilliant brushwork, techniques and colors. One part of the film that museum visitors never get to see was the work done by the registrar who spoke about how she and the conservator carefully inspect the works prior to mounting the show and record even the tiniest imperfections so they can monitor them. If you have the chance to see this film, I think you should!